Beautiful Hamadan design rug handmade in pure silk and is of the finest quality. The colors are natural and give a very rich look. It has taken about 7-8 months to weave this stunning piece. Gorgeous Hamadan design rug intricately handcrafted by our skilled artisans. This rug is one of its kind and is a unique product. This is a Handmade Kashmir Pure Silk on Cotton rug. 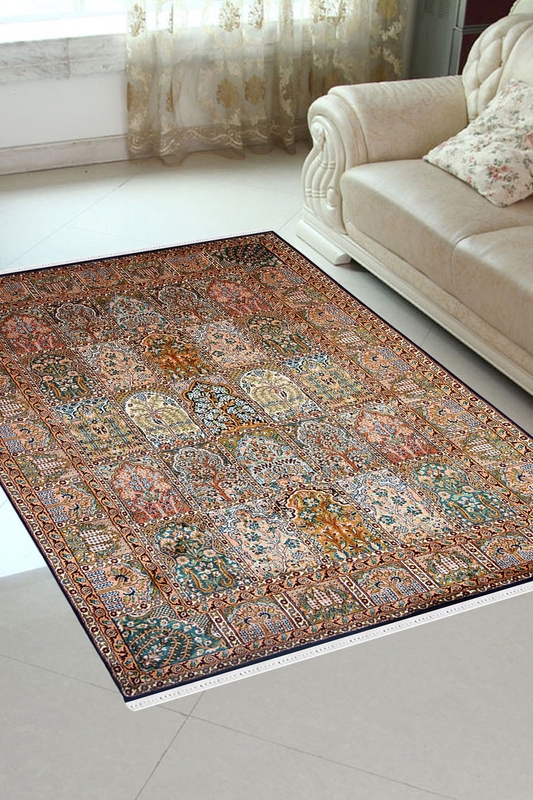 This rug is Handmade in cotton base and has pure Kashmir Silk on top. Number of Knots in this rug are 324 knots per square inch. The rug has a series of symmetrical short and long boxes woven in unison. The design is Hamadan and has been originated from a province called Hamadan which is the south-western part of Iran in the late 19th century. Perfect for a formal living room or as a wall hanging.